Japan has a culture that makes it difficult for women to work after having children and that makes life exponentially harder for single mothers. 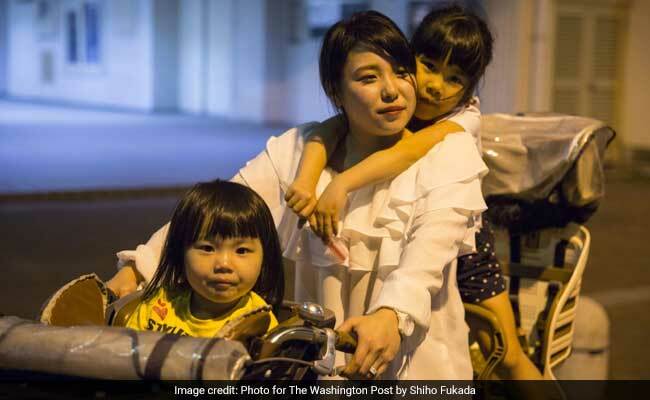 Masami Onishi, 23, with her daughters on a bicycle. OSAKA, Japan: The country suffered a "lost decade," and then another one, after its bubble burst some 25 years ago. To this day, despite Prime Minister Shinzo Abe's efforts to reinvigorate it, Japan's economy remains in the doldrums. Now, experts are warning of a "lost generation" - a whole tier of Japanese children who are growing up in families where the parents - or, often, a single parent - work but do not earn enough to break through the poverty line. "The Japanese economy has been getting worse and worse, and that's hurting poor people, especially single mothers," said Yukiko Tokumaru, who runs Child Poverty Action Osaka, a nongovernmental organizational that helps families in need. The judgment and stigma that single mothers face in many countries are taken to another level in Japan, a homogeneous society where those who do not conform often try to hide their situations - even from their friends and wider family. But Japan also has a culture that makes it difficult for women to work after having children - changing this is a key part of Abe's solution to the country's economic problems - and that makes life exponentially harder for single mothers. "We have this culture of shame," Tokumaru said. "Women's position is still so much lower than men's in this country, and that affects how we are treated. Women tend to have irregular jobs, so they need several jobs to make ends meet." Children play at Nishinari Kodomo Shokudo (Nishinari Children's Cafeteria), which provides a place to hangout and offers a meal once a week in Osaka, Japan. Japan does have a welfare system, and it provides benefits according to different situations. A 35-year-old mother in Osaka with two elementary school-aged children and no job can expect to receive $2,300 a month. But the number of families living on an income lower than the public welfare assistance level more than doubled in the 20 years after the asset price bubble popped in 1992, according to a study by Kensaku Tomuro of Yamagata University. Now 16 percent of Japanese children live below the poverty line, according to Health Ministry statistics, but among single-parent families, the rate hits 55 percent. Poverty rates in Osaka are among the worst. "If parents are working poor, their children are poor as well, and the cycle of poverty is handed down to the next generation," Tomuro said. "Poor children can't get higher education, so they end up with a bad job," he said. The prolonged recession created a layer of second-tier jobs, in which workers do not get the security or benefits that had long been standard - damaging their prospects. "They can't start a family as they can't get married or have a child with a low income." This situation is all the more surprising given that Japan does not have anywhere enough children. The country desperately needs more taxpayers to fund the pensions of its rapidly aging society. The falling birthrate means that the population, currently 127 million, is set to drop below 100 million by 2060, and one-third of Japanese will be older than 65. Some kids from poor family rely on school lunch and a cafeteria like this to survive. Community centers in Osaka provide not only free dinners and playtime for children, but also camaraderie for the mothers. 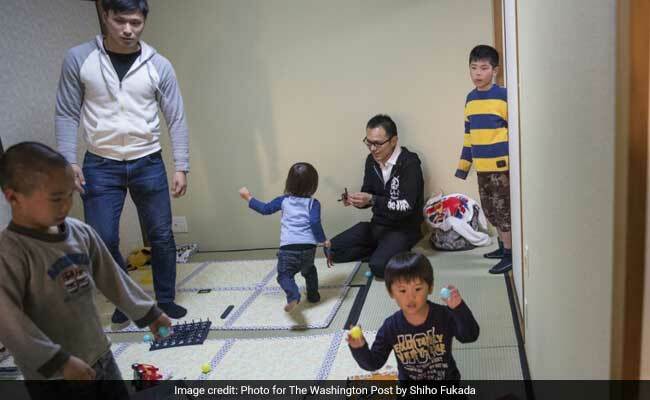 "I feel relieved when I come here with my kids," said Masami Onishi, a 23-year-old single mother who stopped by an Osaka center called Nishinari Kids' Dining Hall, which is in a small, two-bedroom apartment in a housing project. "It's a relief to meet fellow mothers and talk about any difficulties we are having. I realize that I'm not the only one going through this," she said. Onishi has a job operating a machine at a sheet metal factory, but it's a struggle. "And it's fun to come here because I get to see my children smiling and other children smiling, too," she said as her daughters, Sora, 6, and Yua, 3, ate octopus dumplings, an Osaka specialty. "I want 20, and I'm going to eat them by myself!" yelled Masahide, an 8-year-old who came to the center by himself and repeatedly lashed out at other children, hitting them for no reason. 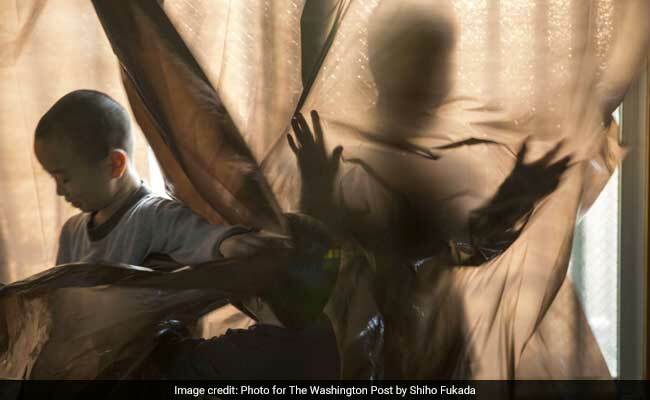 Such behavior is normal among these children, said Yasuko Kawabe, who started the Nishinari center, which relies entirely on donations, after meeting children who were always angry. "I wondered if they were hungry," she said, so she started cooking lessons as a way to feed the children. "I've seen dramatic changes in the kids' behavior. Before, they wouldn't even look into my eyes and couldn't communicate. But they become much calmer here." But it's not just about food. It's also about attention. "These kids don't see much of their parents because they're too busy working," Kawabe said. "So when they're here they're very clingy. They crave attention." Local schools, which once tried to hide their problems, now refer children to Kawabe's center. Indeed, for women trying to operate support groups, even finding single mothers to help can be a challenge - because the sense of shame runs so deep. Some women are so embarrassed about a relationship breaking up that they don't tell their friends, or even their parents, said Junko Terauchi, head of the Osaka Social Welfare Promotional Council, a nongovernmental group helping single mothers with advice and emergency food packages. "Single moms in poverty try really hard not to look poor," she said, describing how they buy makeup and nail polish at the Japanese equivalent of a dollar store so they can keep up appearances. "Sometimes local government officers, who are often men, say things like, 'You don't look like you need welfare.' "
Children of single or poor parents often are ostracized in their communities, Tokumaru said, noting that other parents do not want their children playing with children from a "bad house." The plight of these children only worsens as they become older and face the question of whether to continue their schooling. This is a problem all too familiar for Akiko, a 48-year-old who works part-time at a day-care center and also receives public assistance, but struggles to make ends meet. Her 20-year-old daughter, who skipped school between second and sixth grade because she was bullied for having separated parents, did not pass the exam to enter a public university. So she's now at a private college. Akiko, who spoke on the condition that her full name not be published because of the stigma, has been challenged by local officials over why she's trying to put her daughter through a private college. "I felt hurt by these kinds of comments at the beginning, but now I've become accustomed to it," she said, noting that a welfare officer, of all people, should not be trying to perpetuate the cycle of poverty. Some change is happening slowly at the grass-roots level, with groups like Kawabe's and Tokumaru's putting pressure on local authorities to do more to help single mothers. But change at a national level seems a long way off, they say. "Japan is considered an economic power, but the government keeps saying we are in debt," Tokumaru said. "I feel like Japan is such a cold country towards children. It's really embarrassing."